Hello! Looking for me? I have a new website! Head over to www.quietplaydesigns.com to keep up to date with all the Quiet Play happenings! Oh and if you sign up for the newsletter, you can get your hands on this new pattern of mine - for free! 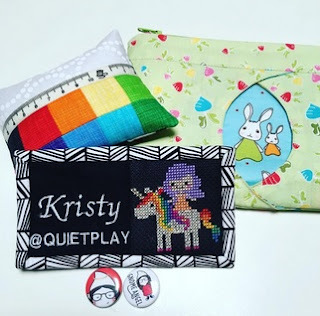 Sign up for the newsletter below or at quietplaydesigns.com, confirm your subscription, then the pattern will be automatically emailed (within 10 mins) to the address you signed up with. 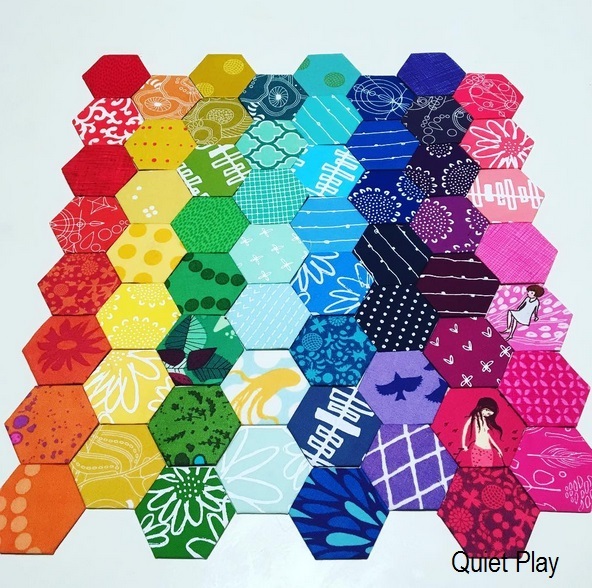 Look forward to seeing you over at quietplaydesigns.com! It's likely not a surprise to anyone, but my geometric sewing machine pattern is my most popular of all my paper pieced patterns. Don't tell my other patterns, but it's definitely one of my favourites! I've made a number of versions in a number of sizes. In fact I've recently added a simplified version in varying sizes to my pattern shop. So now there are options! Because we all like options obviously! Or maybe you'd like one to grace your sewing room wall - without the effort of paper piecing. Maybe you need a clock? Well look at this - I've got you sorted! 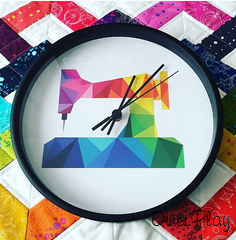 You can now get a geometric sewing machine wall clock. Hooray! And it doesn't even make a noisy tick - so no distractions when you're sewing. Can't get better than that right?! And to finish up on some sewing news... I'll have a new pattern coming out soon that features the geo sewing machine. This time it'll be a pattern to make a full quilt. I'm a bit excited about it - it's currently with testers and I hope to release it in September. So watch this space! I couldn't think of a better title for this blog post than to describe how I feel right now. 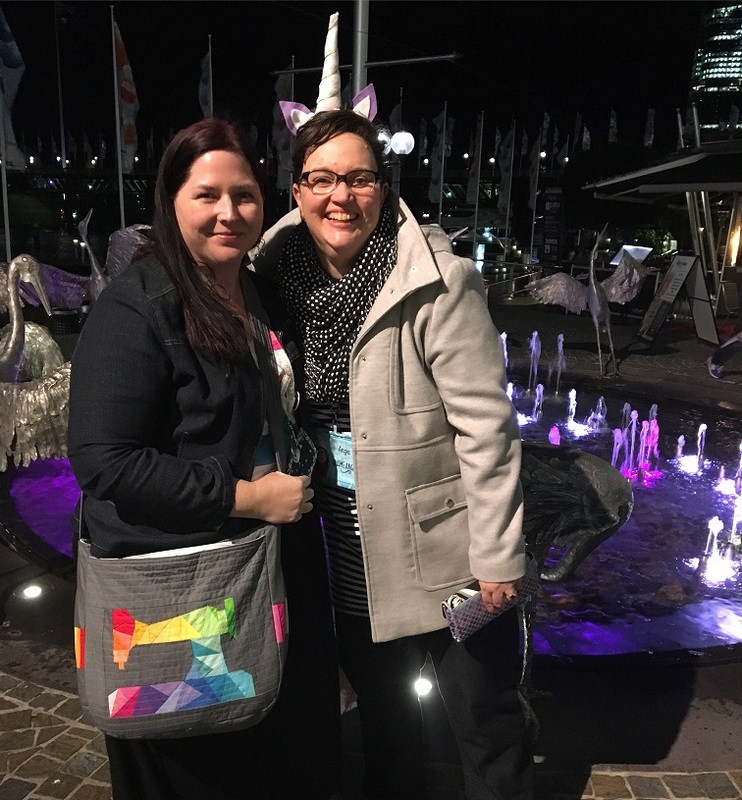 After a weekend hanging out with so many amazing quilty people at the Sydney Craft and Quilt Fair, my inspiration is like... through the roof. 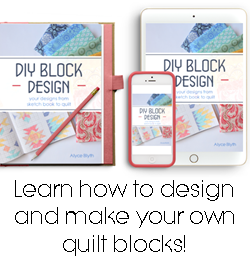 I want to make alllll the things, design allll the things, and talk sewing and quilting and creating ALLLL THE TIME! The Quilt Fair was the first big one I've ever been to. Which in itself was amazing (oh the quilts! We'll be sharing pics on IG at @makemodernmagazine), but the people. That is what took it from amazing to fan-freaking-tastic. I met so many incredible people! So so many. But I digress. I need to backtrack a little way and share a tiny bit of the lead up to the craft fair. 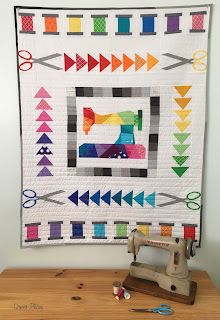 Don't worry, it involves quilty pictures! No not the pincushion. Too heavy to wear but it graces my sewing desk quite nicely, thank you very much. That's my name tag made for me by none other than the amazing Angie of GnomeAngel (who I got to meet! More about that later!). Isn't it seriously perfect?! I shall have to remember to do a blog post about the name tag swap because Awesome. But back to the bag. 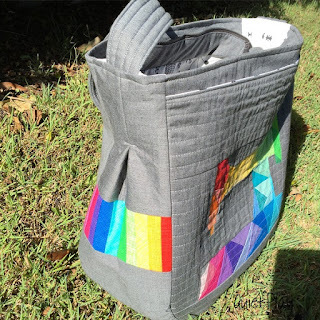 It's a Super Tote designed by Noodlehead. Now I'd seen many of these around and thought they were cool, then I saw Erin's (@quilybystarlight) version and about died. She was a clever clogs and added my geometric sewing machine to the front. With her permission and encouragement, I blatantly copied her idea - but with a rainbow version. 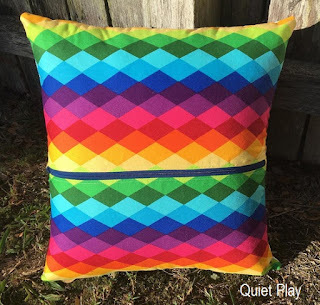 This pattern is in my Craftsy shop for the curious - and I made it with 25 Sketch prints and 25 solids. I like rainbows, what can I say? I even added a rainbow gusset (oooh fancy). So between the bag and the name tag, I had the perfect quilty icebreaker to talk to quilty types. Not that I necessarily needed it, I was so excited I think I talked to anyone and everyone who vaguely glanced my way. My social skills may need work. I was lucky to have two beautiful IG friends, now turned besties (obviously) to hang out with for the weekend. 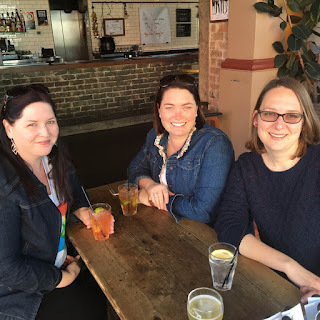 I could not have asked for better company - Keera from Live Love Sew, and one of my partners in crime from Make Modern Magazine, Lara (@luellabella). 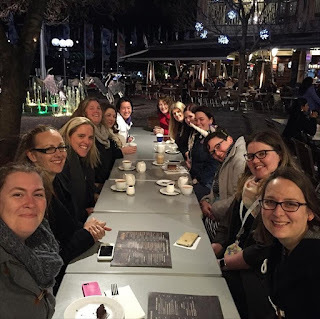 Fortunately we had organised a dinner for the first night (with the help of my partners in crime Keera @livelovesew and Molli Sparkles (@molli_sparkles). Best thing ever. Around 30 quilty types all hanging out, drinking and talking and yelling and laughing - followed up by an indulgent chocolate dessert at the Lindt Cafe at Darling Harbour. That pic only shows half the awesomeness that attended our dinner. I stupidly didn't manage to get a photo of EVERYONE who came - but trust me - all brilliant. I don't have enough superlatives to describe how fantastic it was to meet everyone and hang out and chat and talk and chat and talk. In fact I don't have enough words to describe the entire weekend. If you have a chance to do something like this, I so encourage you to go for it! It's like you've found your tribe. You have all these people who totally get you, get what you love, and share your passion. There's something a little magical in that. 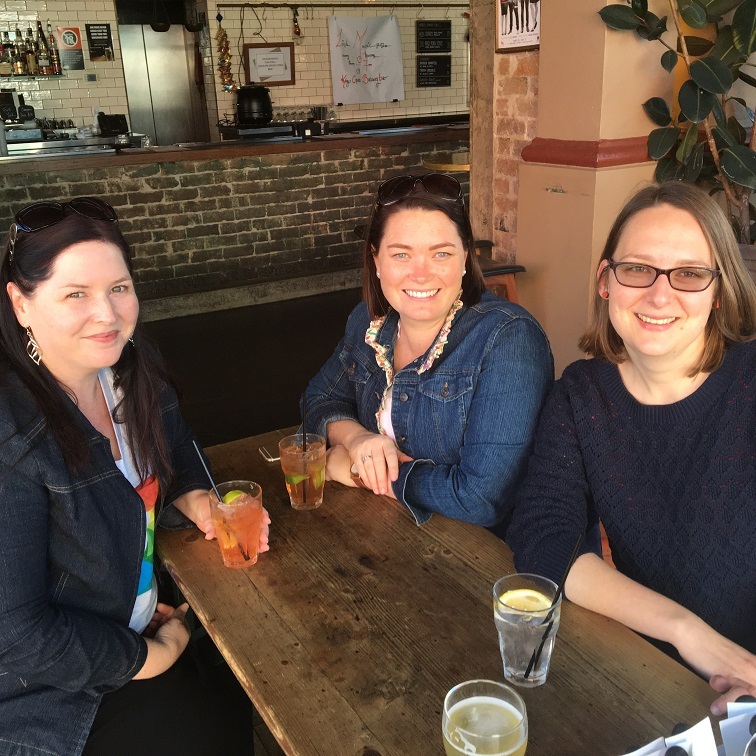 So much time spent talking, bouncing ideas off each other, sharing knowledge and discussing all things quilty. You really can't get much better than that. And on that note, I'm off to work on my to-do list which has grown five fold with all the inspiration and creativity I encountered over the weekend! Hope your day is the same! A Hover of Helicopters - RJR Fabrics What Shade Are You? Hello! My name's Kristy Lea of Quiet Play. 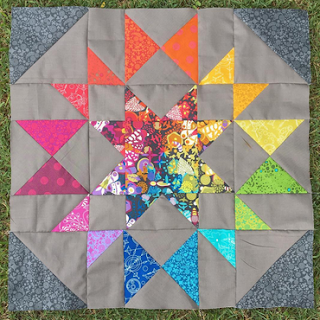 I'm a bit of a foundation piecing fanatic, so when asked to join the RJR What Shade Are You blog hop, well there was only one thing to be done. Design a foundation pieced pattern, perfect for use with solids. I knew I wanted to do something with rainbow solids (rainbow is my favourite colour, let's be honest!) and the timing happened to coincide with the early arrival of my darling new little nephew. Both his parents are helicopter pilots, so it seemed only natural to design rainbow helicopters. Ok well not actual rainbow helicopters, but little helis in rainbow order. With fluffy white clouds. Because who doesn't love clouds? 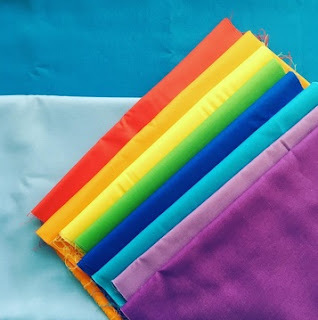 Picking fabrics for a project is probably one of my most favourite parts of quilting. And this was no different. I went for bright, bold colours to make for a very happy rainbow hover of helicopters. Bora Bora and Poolside for the background colours. Ah pretty pretty. 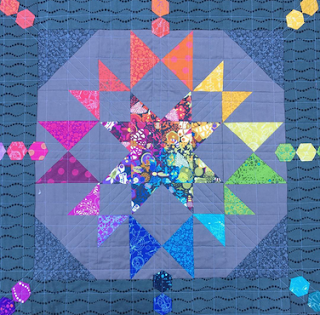 The cotton supreme solids are beautiful for foundation paper piecing. The seams crease perfectly and you get such a crisp look with paper piecing. It was hard to stop at just 6 little choppers! Here's a close up of the helicopters. After a bit of deliberating, I decided to personalise it by paper piecing my nephew's name as the centre piece of the quilt. 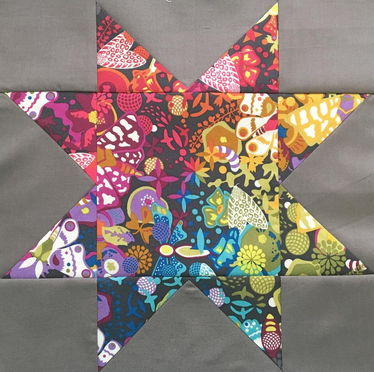 This was just one of those quilts where the design and the piecing all just came together beautifully. Finished it off with wavy quilting to give the little helicopters some movement. The hardest part of this project? The photography most definitely. 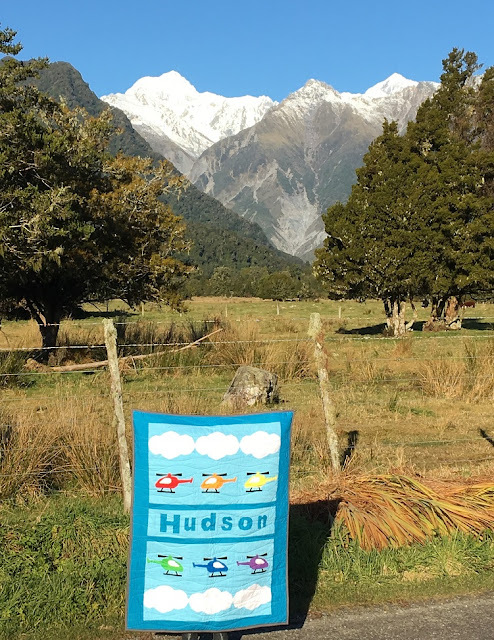 I know, I know, it's hard to decide whether to look at the quilt or that scenery isn't it! 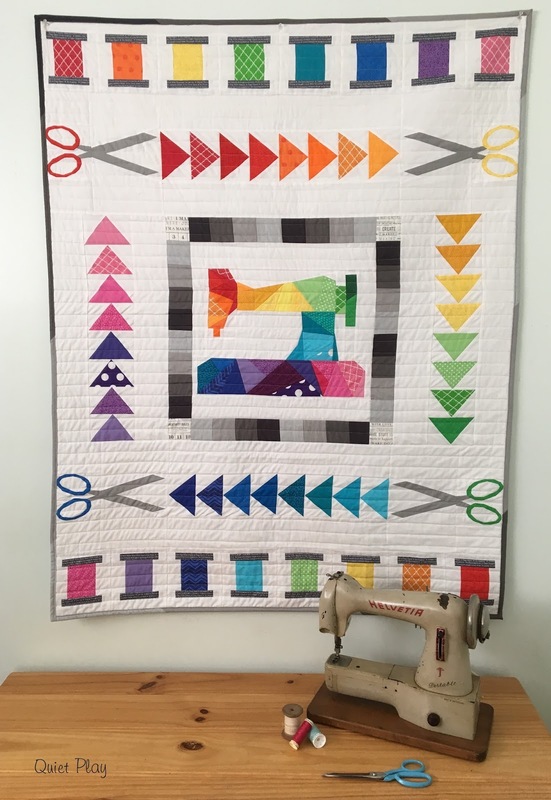 All the patterns used in this quilt are listed in my Craftsy shop - helicopters, clouds and the alphabet is from my Geometric Alphabet patterns. If you love a bit of paper piecing shenanigans, pop over and check out my Instgram feed @quietplay or my blog - Quiet Play. Thank you to RJR Fabrics for including me in this very fun blog hop - I've loved seeing what everyone else has made, as well as working with these fabrics myself. Foundation piecing can sometimes be a little frustrating - it's a technique that takes practice. 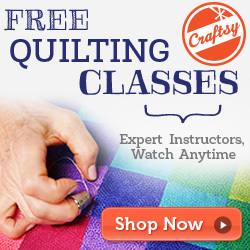 Once you get the hang of the basics though, there's nothing stopping you from tackling the most complex of patterns. But along the way, there are a few little tips that might help you. 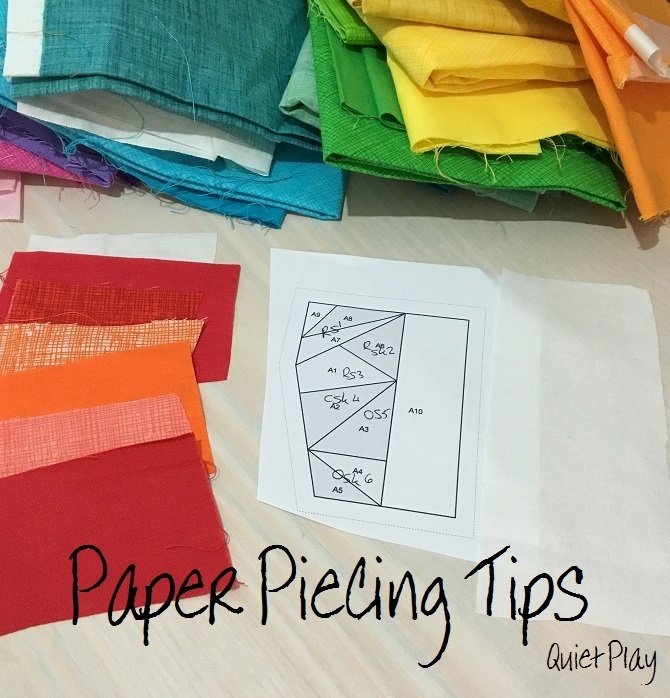 Or at least - make paper piecing seem a teeny bit tedious. So I snapped these pics during my recent paper piecing shenanigans (notice all that pretty rainbow stuff happening in the background? Yeah I'm totally in my happy place). Let's start with the very first thing you should do when paper piecing. It's all about stitch length, because size really does matter. Here's a visual shot to show you of where my stitch length sits when I'm paper piecing. That's right - allll the way down to around 1.5. This makes teeny tiny stitches. Which in turns makes the paper removal an absolute breeze. However if you stuff up your seam, and need to unpick it, well let's just say there might be a few swear words involved. So if you have a tricky seam where you have to line things up just perfectly, consider using a much larger stitch (4 or so) and stitch the seam. Open it up to see if you're happy with how it looks. If so, shrink that sucker back down to 1.5 and do it again. If it didn't work, make friends with your seam ripper and pull it out and do it all over again. Even after many years of paper piecing, I still use a basting stitch if I'm not certain. It's much better than unpicking teeny stitches! 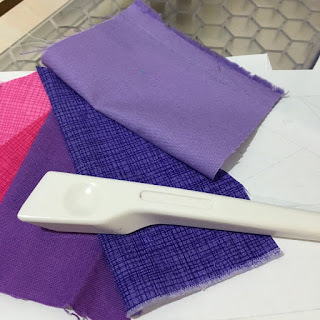 Next tip in this process... rough cut your fabrics to size and put them in order. Pictures first, explanation second. This shows two pictures of sections I was piecing. 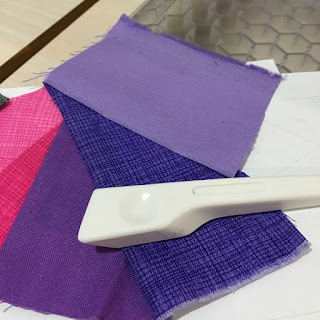 As I work through sections, I rough cut my fabric to size. 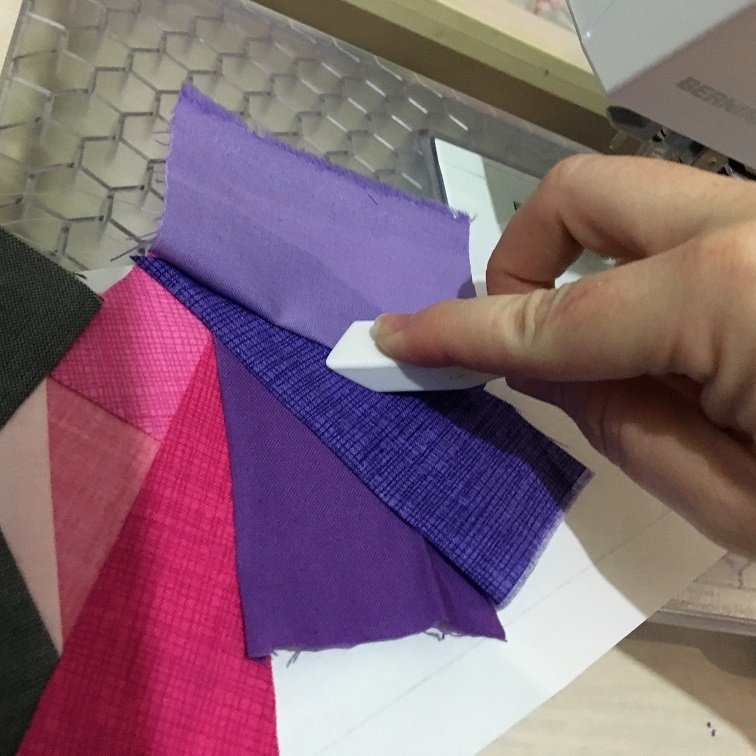 That is I grab the first colour, lay it over the paper template and make sure I cut a big enough chunk to still have 1/4" seam allowance all the way around. I tend to err on the generous side. It makes life easier, trust me. However if you're a bit OCD about your stash, you may not love having rough chunks cut out of your pretty fabrics. So another option - you can use your ruler and measure how wide the section to piece is (don't forget the seam allowance) and cut a strip with your ruler. 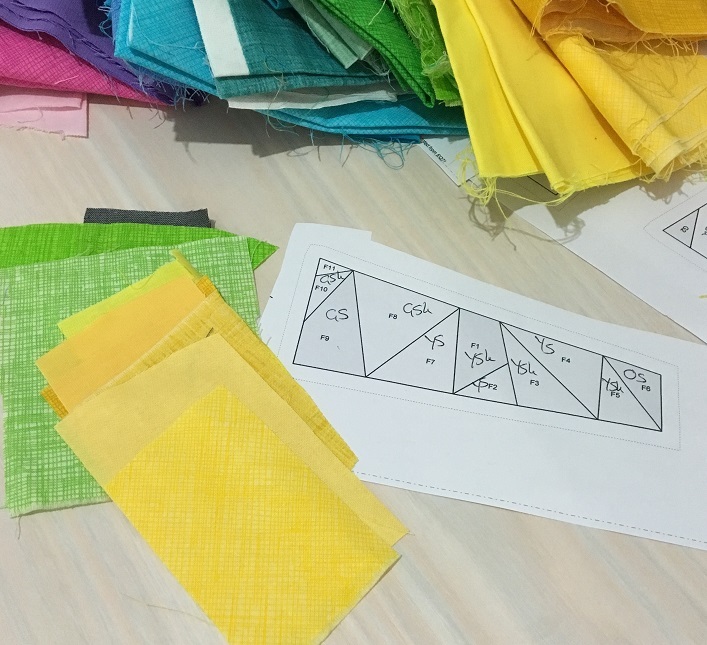 I do this if I'm paper piecing the same pattern mulitple times and know I'll need the same size pieces of background fabric for multiple sections. It doesn't stop there. Cut your fabrics in order and lay them in a pile IN ORDER. Nothing worse than grabbing the wrong scrap and piecing it in the wrong place. Not that I'd ever do that. Ahem. This makes it quicker to piece each section when you can just grab a fabric scrap, sew it up, move along to the next one. Try it. You'll like it. Last tip for today - and this one involves a notion that you're going to want in your paper piecing toolbox - a Clover Finger Presser. Ok it doesn't have to be Clover branded, but that's my preferred one. You can also use a seam roller. Just something that will save you trips to the iron for every.single.seam. See how that seam is sitting up after being sewn? Naughty seam. Normally this would involve a trip to the iron to smooth it flat before moving on, right? Not necessarily. Just watch. Side note: it's very hard to take a photo of yourself demonstrating the use of a magic sewing tool, so forgive the weird angle. But here you see the Finger Presser in action. It's like magic, really. Now look at how lovely and smooth that seam is! Good seam! And now you can move onto the next piece (from your nicely orderly pile of rough cut fabrics). I like to piece alllll the sections at once, then iron them all at once, then trim them to size all at once. It's a bit of a factory production line, but that's how I prefer to do it. Then I iron again when joining the sections. You can use the finger presser on these joining seams too, but I find an iron does a better job. While we're talking about irons - again personal preference. I use a dry iron. I found using steam, sometimes the water would leak and could make the ink on the paper run (possibly staining your fabric!). Plus I never have to worry about refilling the water. Dry iron all the way. For the longest time I didn't think hexies were ever on the cards for me. 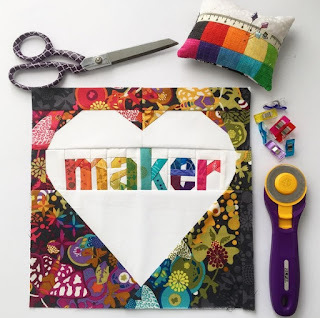 I'd admire them, and look at them and dream of pretty things I could make with them - if only I could machine sew them. I have joint problems so I didn't think hand sewing was going to be something I could do. But it turns out, I can make a few hexies here and there with no problems - and the pile seems to grow rapidly. 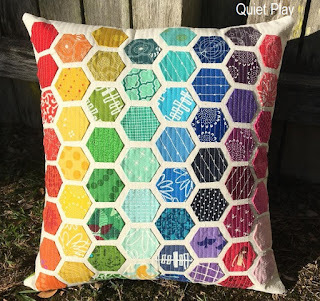 Then I discovered Nicole of Modern Handcraft's Modern Hexie tutorial. 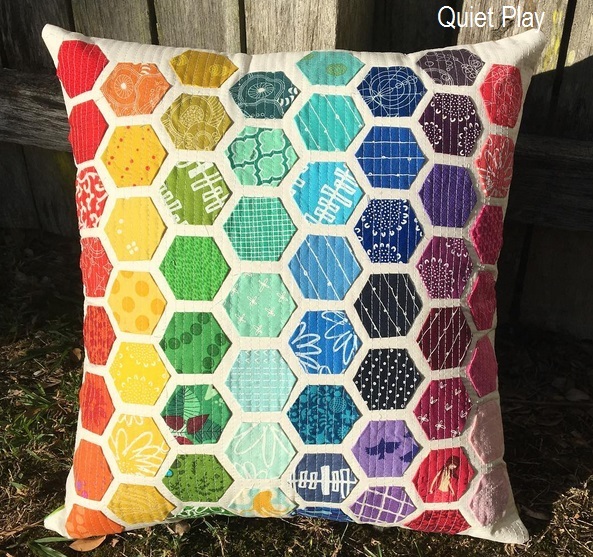 A method where you quilt the hexies into place rather than hand sew them together. The hand sewing is where I didn't think I could manage so machine sewing? Brilliant! This cushion was the result of my first attempt. I was using a borrowed machine (as mine is in the repair shop) and it was a little fussy. But I love the end result. I straight line quilted in on direction to keep the hexies in place, rather than in different directions like Nicole's tutorial. I love how it looks. Also the opportunity for fussy cutting? Perfect! And using up scraps? Even better! I gave the first cushion as a birthday gift to one of my daughter's little friends. My friend Jane was rather taken with it, so I decided to surprise her with one of her own. A little less fussy cutting and a little more of my favourite fabrics! I backed it with even more rainbow fabric on the back. Because rainbow goodness is what everyone needs in their life! Recently I was fortunate enough to do a little bit of pattern testing. Usually it's the other way around and I'm sending out patterns for testing. It was a bit fun to be on the other end of the pattern, so to speak! 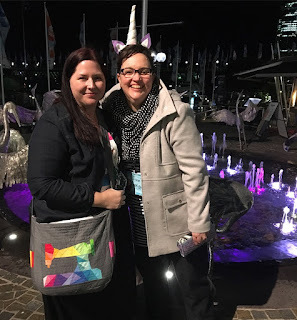 My gorgeous friend Keera from Live Love Sew has just released 4 brand new patterns - and I got a sneak peek to test Homeward Bound. 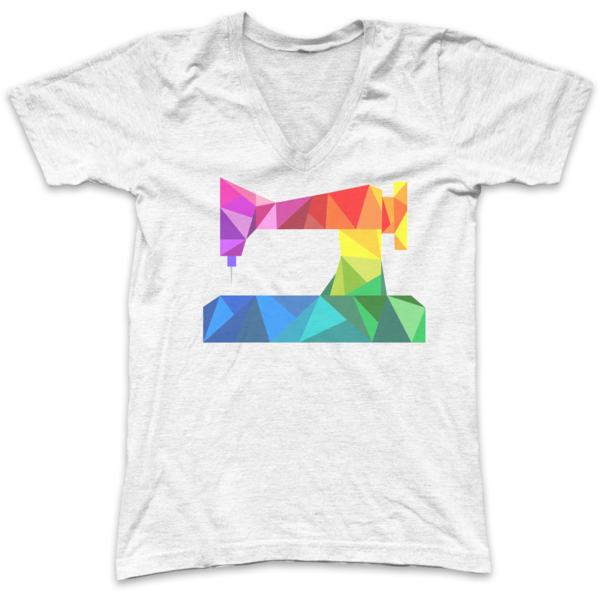 I couldn't resist making a rainbow version with Alison Glass prints - and paired with the grey. Oh so pretty right?! The centre I made with Ex Libris panels - which I just adore! It wasn't easy to cut them up - but I think it was worth it for how pretty it looks. Then. I had to add my newest obsession. Little hexies I've been making out of Sunprints (also by Alison Glass). I had quite a collection and it just seemed right to add them to this block. The quilt block from Homeward Bound is quite large - 24" square. So I decided to add just a little bit, with the hexies and call it a finished lap quilt around 35" square. Perfect for my Miss 5 - nearly 6. 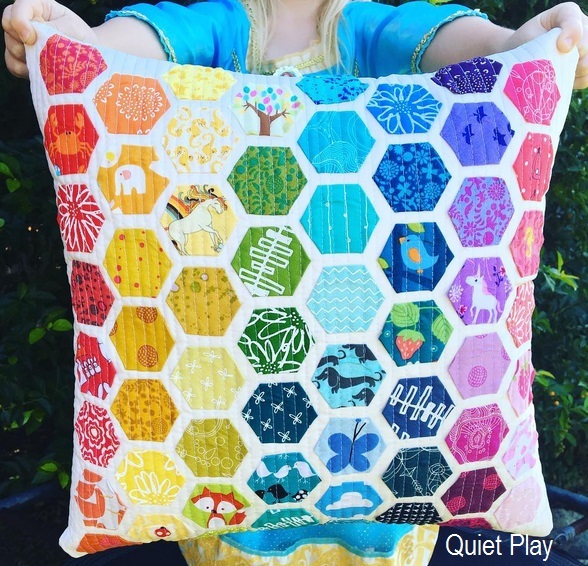 She has quite a collection of quilts these days! Here's how it finished up! I so love how the dark grey for the background makes the rainbow just sing! It's a nice little comfy quilt and the fun part is my gal helped me sort out the hexies and was involved in the layout. Always a bit special when you can work on something together! Keera has just released this one as one of four new patterns last week - so now's your chance to nab a copy of Homeward Bound (in either PDF or paper version) and give it a try yourself! You can find Keera's blog and pattern shop here and on IG as @livelovesew. Also anyone going to the Sydney Craft Fair at the end of June - let me know! Keera and I are meeting up, and also planning an IG meetup dinner one of the nights. We'd love to meet anyone else going along! Drop me an email if you're interested!